Auf der Insel Sizilien gelegen, ist der Ätna der höchste aktive Vulkan Europas. Erkunden Sie die verschiedenen Aspekte dieser aktiven Tour von Catania aus, bei der Sie den Vulkan entlang eines Pfades zum inneren Krater hinaufwandern. Sehen Sie Lavaströme, lernen Sie die geologische Geschichte des Vulkans kennen, bewundern Sie das Panorama und wandern Sie in eine Lavahöhle. Loved the tour! It was well-organized, informative and very fun. We hiked to craters through the snow, explored a lava cave, saw several enormous lava rivers and stopped for some delicious hot chocolate YUM! An incredible time! Really enjoyed this tour. The weather was great and our guide Filippo really knew all there is to know about the volcano providing information in an interesting and friendly manner. Great value for money. Viator also provided trekking shoes free of charge. Highly recommended. It was enjoyable but very easygoing and light. Just brisk walking really and I was expecting a bit harder and tougher. Good for families with kids. I believe this is a must-see if one is in the Catania area. There are many charming places with great food, but there is only one Mt. Etna. Our guide, Filippo, was extraordinary. He knows every scientific fact about Etna, combined with outstanding communication skills and unmistakable Sicilian charm and passion. Who could ask for anything more? This tour was amazing, Mt Etna is a stunning place and such an integral part of Sicilian culture, the landscape and history. Our tour guide was brilliant. His knowledge of geology and Mt Etna's history was impresssive. He was also very accommodating with the needs of our tour group. Thank you! The staff went to great lengths to ensure we knew exactly where to meet them for the pick-up. Our time was critical, as we had other committments afterwards, and this was appreciated. The tour guide was very knowledgeable and informative, and this made the trip up Mt Etna especially enjoyable. Altogether, a very enjoyable experience!! Wonderful!! Our tour guide, Francesco, was really professional and knew everything about Mt Etna. She took us on a hike to several craters and volcanic holes and explained very clearly how those were formed. It was a very pleasant trip, and I would definitely come back to see the beauty of My Etna again with Francesco as our guide. 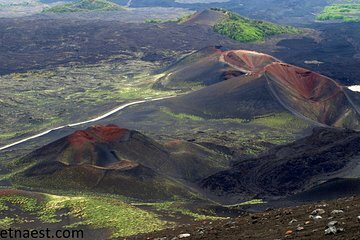 Nous sommes rentrés enchantés de notre Etna Morning Tour. Tout d'abord, Francesca, ponctuelle, est venue nous chercher au B and B à 8H30 puis nous avons récupéré 4 autres participants. Nous avons tout de suite été conquis par sa passion communicative pour l'Etna. Beaucoup d'informations durant notre ascension en 4/4 1heure, le tout dans un Français parfait. Puis, arrivés à 2000 mètres, nous avons entamé la randonnée de 3 heures : pas de difficulté, dénivelé de 300 mètres mais fréquents arrêts pour les explications. Les paysages sont magnifiques et inattendus , les explications de Francesca très instructives. C'est une guide très professionnelle, impliquée et passionnante. Vous pouvez y aller les yeux fermés vous ne serez pas déçus !